Our wine and champagne collection here at Flowers Aberdeen is perfect for when you want to really treat your recipient with more than just a bouquet of flowers. 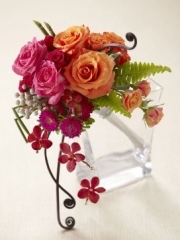 Our flowers are of the highest quality and are sure to delight your recipient. And in our collection of wines and champagnes we have red wine, white wine, sparkling rose wine and high class champagne. Here at Florists Aberdeen we have a massive collection of flowers for all events and occasions. We have flowers for birthdays, anniversaries, new babies, for saying thank you, for saying congratulations, whatever your reason for sending flowers, Flower Delivery Aberdeen are sure to have exactly what you need. If you look around our Flowers Aberdeen website you will find all of our bouquets and arrangements. However, if you feel that nothing we have is quite what you were looking for, or if you had something very specific in mind, then you can make use of our Florists Aberdeen bespoke service. With this service you have complete control over what goes into your bouquet. You can choose the types of flowers, the colours of the flowers, the number of flowers in the bouquet, whatever you would like, just let us know and one of our expert florists will arrange it for you. 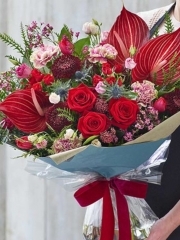 Your recipient will be delighted with their completely unique bespoke bouquet from Flower Delivery Aberdeen. At Flowers Aberdeen we have an excellent selection of bouquets and arrangements for all occasions, but we know that sometimes the occasion calls for something more than just flowers, that's why we have a selection of small gifts that can be sent along with your flowers (or independently) in order to really treat your recipient. We have our selection of wines and champagnes, delicious chocolates, adorable teddy bears, and balloons for all occasions. We at Florists Aberdeen really do have something for everyone, we work hard to make sure that we have everything you need to treat your recipient and make them feel really special. With Flower Delivery Aberdeen your are not just limited to bouquets for individuals, as we also do great decorative arrangements for big events too. We have beautiful table centrepieces that are sure to look lovely in any setting, and we do wedding flowers too! If you want Flowers Aberdeen to arrange the flowers for your special day then simply give us a call and we'll arrange for you a consultation with one of our expert florists. In this consultation you will decide together exactly what would be the perfect Florists Aberdeen flowers for your wedding. At Flower Delivery Aberdeen we are completely dedicated to making your flower buying experience as easy and simple as possible, that's why we have our great delivery service in place. With our delivery service you can arrange to have your order delivered straight to your recipient's front door, or to their workplace. 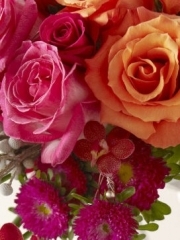 No matter where your recipient is, Flowers Aberdeen can deliver flowers to them in no time. What's more our delivery service is much better than delivery your flowers a day or two after they are ordered, with Florists Aberdeen you can have your flowers delivered the very same day they are ordered. With our same day delivery service you don;t need to worry about last minute gifts looking last minute as our flowers are always to our usual high standard. As long as you place your order before 3pm Flower Delivery Aberdeen will be able to delivery them that day.